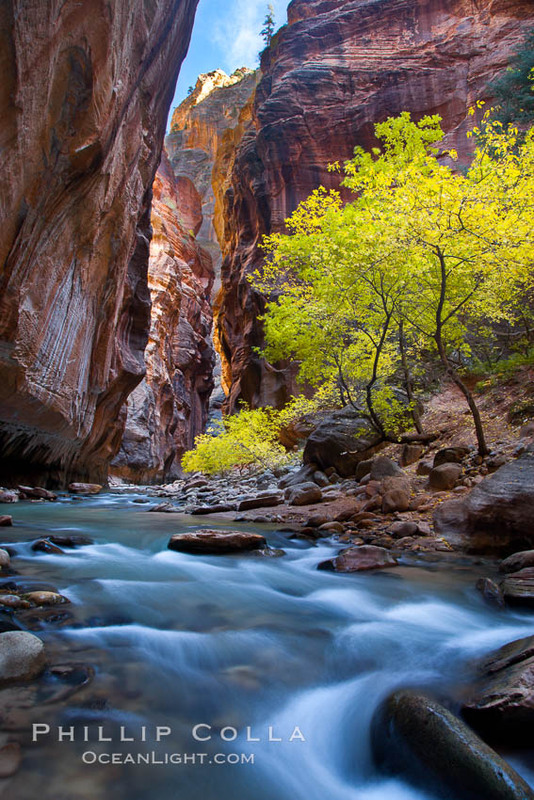 The Virgin River Narrows in Zion National Park is an incredible slot canyon carved out of the red rock sandstone that characterizes this part of Utah. One can walk upstream on the river bed from the Temple of Sinawava for several miles. I plan to return with my daughter next year. While this is not a difficult hike, my hunch is that it would feel like an adventurous outing to a youngster (perhaps akin to hiking the Mist Trail in Yosemite when the Merced River is at peak flow). We walked as far as the “Wall Street” section of the Virgin River Narrows before turning around. The return hike back downstream was definitely easier, with the flow of the Virgin River gently pushing us back to the parking lot. We timed our visit for what we hoped would be the peak of fall color in Zion National Park and we were not disappointed. The cottonwood trees were blazing yellow, while maples were typically turning red. Below is one of my favorite sections of the Virgin River Narrows, with a large shore along the river providing habitat for a group of cottonwoods to grow.